The President of Ireland speaks at virtually every one of his public engagements. Through the written and spoken word the President articulates the vision and themes of his Presidency to the public and seeks to focus attention on the issues and problems that are important in our shared civic life. Through his speeches, the President contributes to the public discourse and encourages new ideas for shaping Ireland’s future. 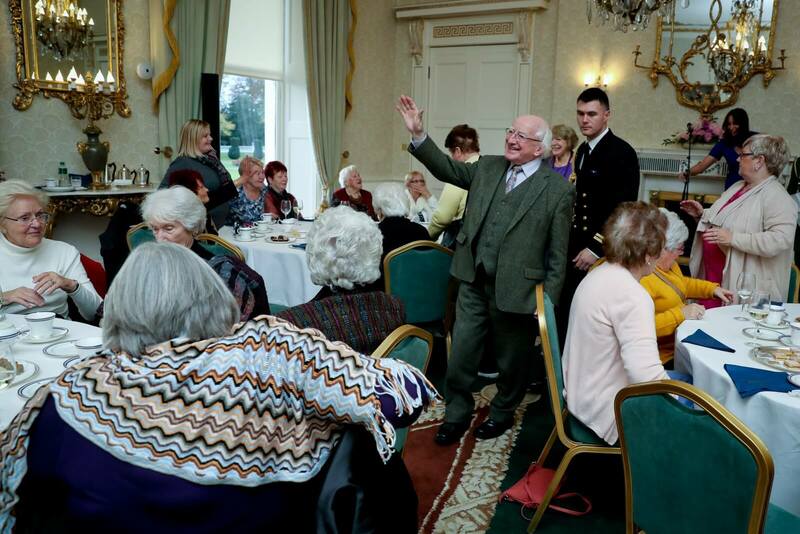 A Tour & Meet: Many large groups of people come to Áras an Uachtaráin to meet the President. At these events, the group are welcomed by the President’s Aide-De-Camp (ADC) and brought to the State Reception Room. In the State Reception Room the ADC briefs the group on what to expect when they meet the President. The President meets the group in the State Reception Room, welcoming each guest individually. He then delivers informal remarks to the group after which they usually have a group photo with the President. The group is then invited to enjoy refreshments in the State Rooms and, schedule permitting, the President joins the group for an informal chat. Once refreshments are finished the President’s ADC brings the group on a tour of the historic State Rooms. Courtesy Call: a courtesy call is arranged when smaller groups of people come to Áras an Uachtaráin to meet the President. The group is welcomed by the President’s Aide-De-Camp (ADC) and brought to the State Drawing Room. In the State Drawing Room the ADC briefs the group on what to expect when they meet the President. The President meets with the group in the State Drawing Room, welcoming each guest individually. Schedule permitting, the President then invites the group to join him for refreshments in the State Drawing Room. Reception: occasionally the President invites large groups to Áras an Uachtaráin for a reception, to honour particular people or achievements. At a reception guests are invited to join a receiving line in the Francini Corridor so that they have the opportunity to meet individually with the President and his wife, Sabina. The President regularly travels throughout the island of Ireland, for community or official events. Details of the President’s public engagements around the country are available via the public engagements diary section of the website.